Do you or anyone you know need help filing your income taxes? Want this done free? As a service to the community, CASH (Creating Assets, Savings, and Hope) helps working families get the money and assistance they’ve earned by providing free income tax preparation and e-filing for those who may be less able to afford a paid tax preparer. Typically, those who have worked in the past year and earned less than $40,000 are eligible. While most returns can be done, some may be more complex and need referral to a more specialized preparer. The dates, places, and times that CASH will provide these services are listed below. Help will also be available en Español. City Councils from Albany, Rochester, and Syracuse will also pass similar resolutions. Locally, Assemblymember Sam Hoyt and Erie County Legislator Maria Whyte will introduce matching legislation at their respective levels of government. Our friends at CASH (Creating Assets, Savings, and Hope), a project of the United Way, has announced their CASH IN event for January 26th. This is a great opportunity to link with free tax preparation, credit reports, benefits eligibility, and more. Please see below and the attached flyers and notices. 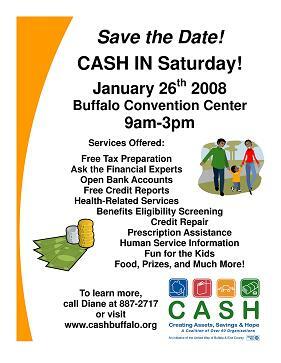 To kick off the tax season CASH Buffalo is hosting an event called CASH IN Saturday on January 26th from 9am-3pm at the Buffalo Convention Center. Some great services available at CASH-In Saturday include free tax preparation, free credit reports, benefits eligibility screening, and much more. 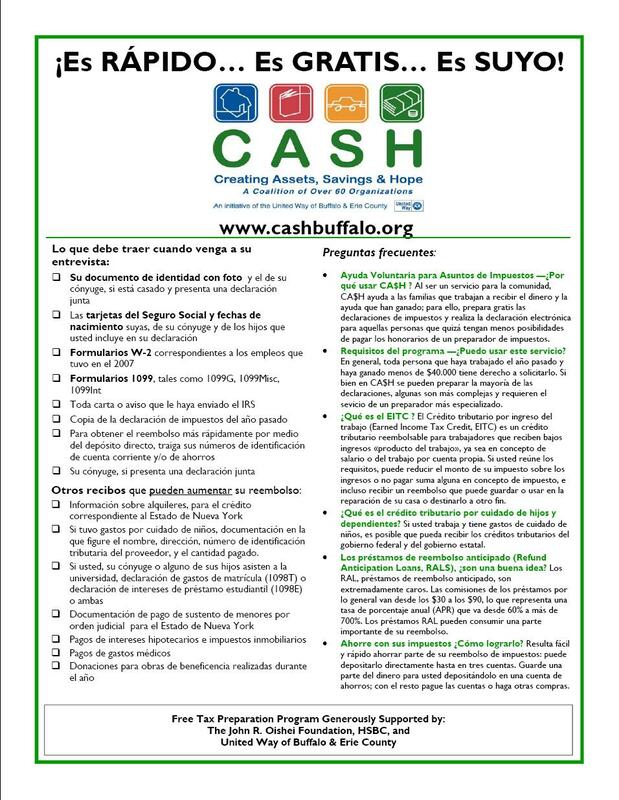 CASH (Creating, Assets, Savings, and Hope) Buffalo is a coalition of over 60 organizations committed to serving hard working, low income families by offering a free income tax preparation. Over the last two years, our local volunteer network, often made up of faith communities like yours, has completed more than 21,000 state and federal returns for families and individuals and brought more than $26 million dollars into the community via tax refunds and credits. 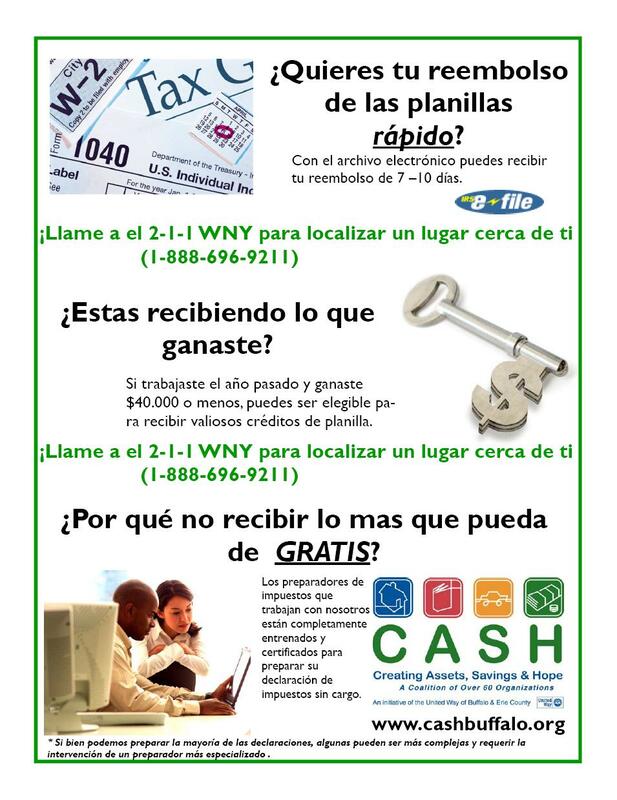 CASH currently operates a free tax preparation program at 10-11 sites across the city of Buffalo each year. 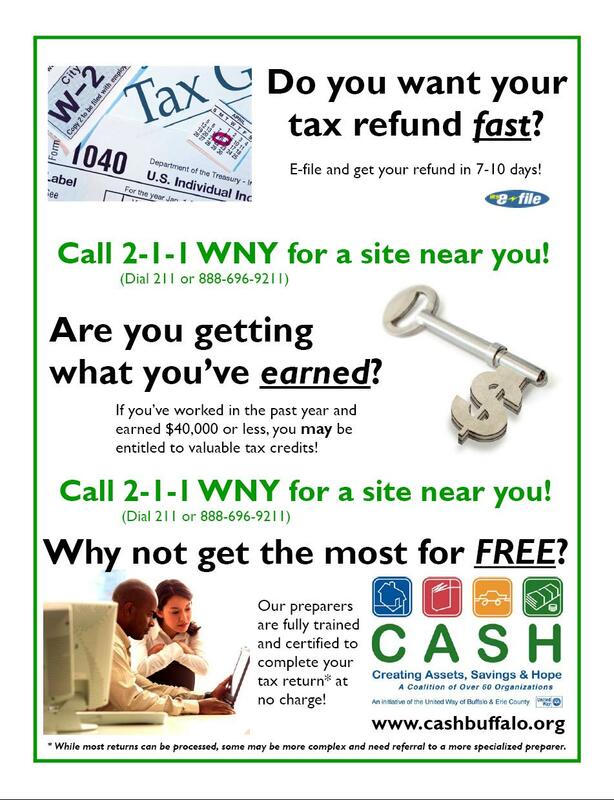 Included are a couple flyers on the free tax preparation available to share. We are also happy to come to you and give a presentation on the free tax preparation network. Services are available to most people who had an income less than $40,000 this year. Its fast, its free, its yours. 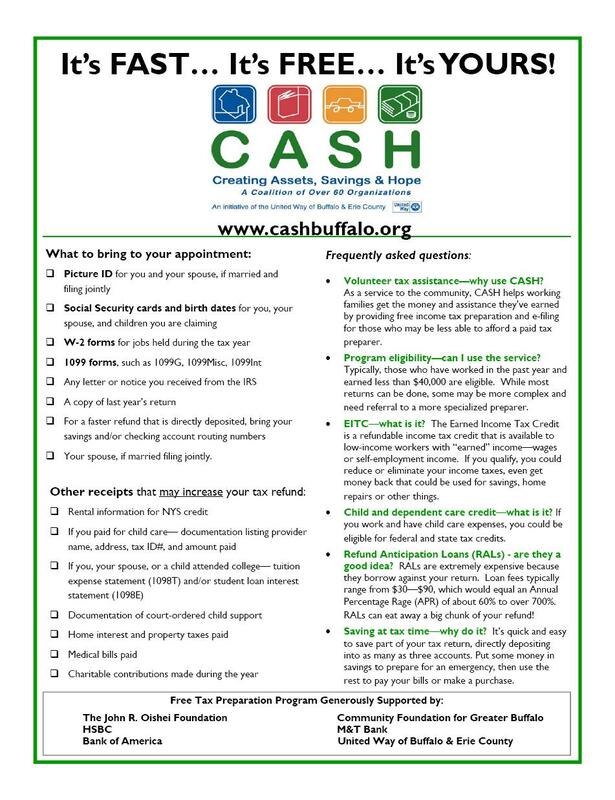 If you should have any questions about the Free Tax Preparation Program and the work being done in the community, please contact Diane Bessel, Director of Creating Assets, Savings & Hope at 716-887-2717 or email diane.bessel@uwbec.org.